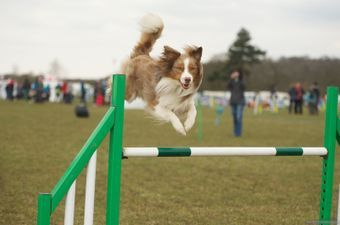 All of our own Mini Aussies and lots of the puppies that we have bred have gone to homes where they train and compete in agility. Some are already out there winning and others are stars in the making! 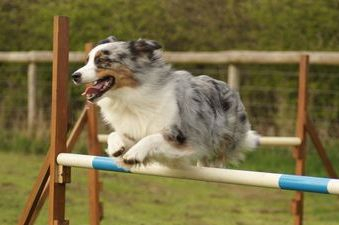 All of them enjoy themselves doing agility with their owners which is the most important thing! 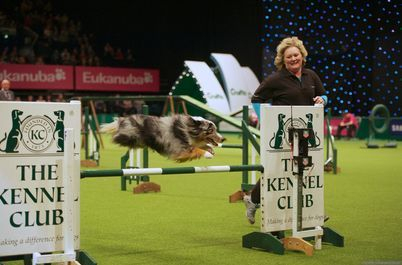 Flossy competed in the main arena at CRUFTS 2011 after winning the KC Novice Cup Semi Final at the International Kennel Club Festival. 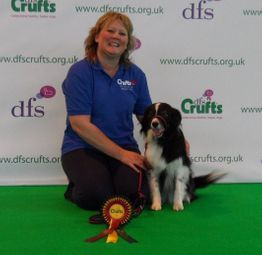 Flossy won round 1 in Novice Agility at Crufts and came 2nd overall in the KC Novice Cup Final. 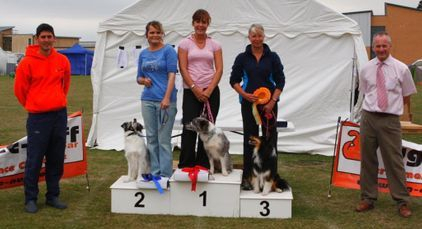 Flossy came 3rd in the Dogs in Need medium Novice grade 4 -5 Final & also qualified for the Supadogs Finals in both 2010 and 2011. 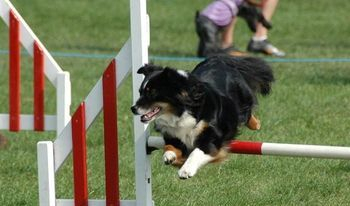 Flossy won the Darl Supa-dog Rescue League for Medium grade 3 dogs in 2010. 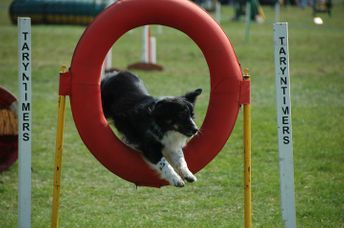 Flossy also Won The Agility Eye - Top South East Grade 3 in 2010. 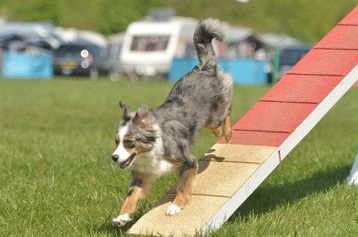 Billy has achieved his Gold Agility Warrant and has won many top placings at shows. His current AW points total is over 800 points! 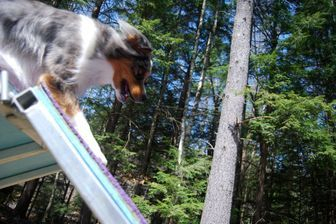 She is now competing and getting placed in Championship level Classes at KC Agility shows. 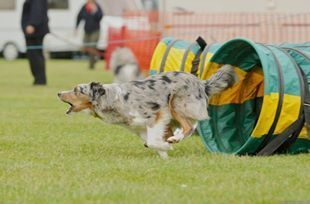 Rizzo is large grade 4 in KC Agility and has been getting placings in the trophies since competing at grade 4. 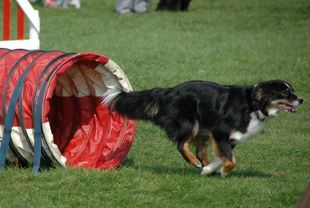 Rizzo competes in Novice at UK Agility shows. 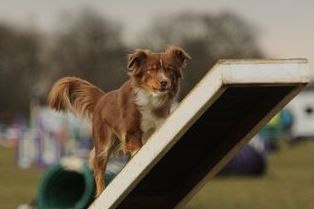 Cajun had a bit of a delay to the start of his agility career due to the fact that I was out of action for a year! 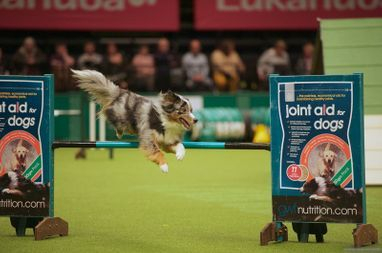 We fitted in a couple of shows at the end of last year just for experience which he enjoyed. 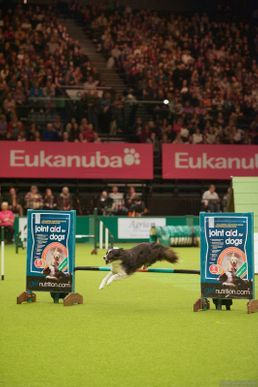 Cajun's done training over the winter and is keen & raring to go this year! He will be competing in Medium grade 3 at KC shows. Fae has already shot up the grades to grade 6 in KC Agility. Fae was only 2 years & 2 months old when she won into grade 6! 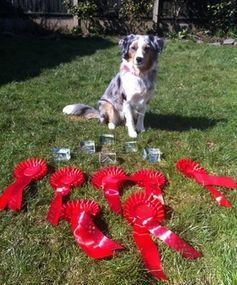 Fae she won 7 classes at one agility show! 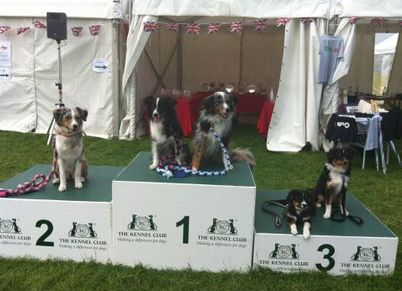 They won the 2013 DINAS Medium Grade 5 Agility Final! 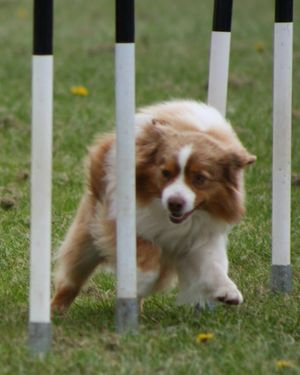 Brew has already won an Agility class at an Agility Addicts unaffiliated show and has multiple top placings at both KC & unaffiliated shows. 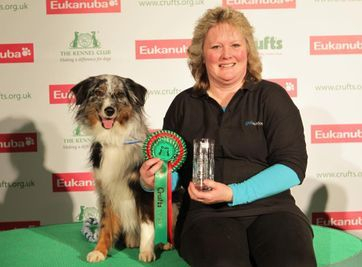 Brew won Grade 3 Agility and is now into grade 4 & winning trophies at that grade at KC shows in large height. Penny has just made her debut in Medium KC competitions and is very keen! She has won up to grade 5 already and Penny won 3 classes at her last show. Penny is currently being handled by Carol Disley but Pat hopes to be back in action running Penny by next year. 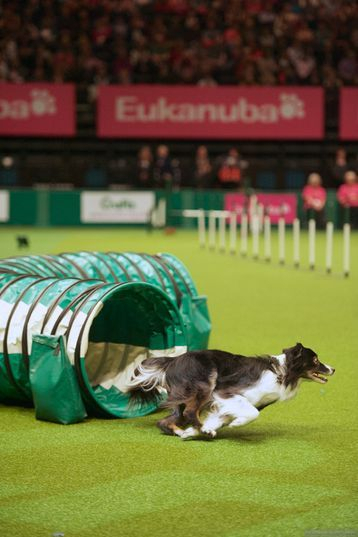 Keep an eye out for Vicky Bowe who owns & handles Dunnellons Belle of the Ball who is competing in medium KC Agility competitions at grade 5. 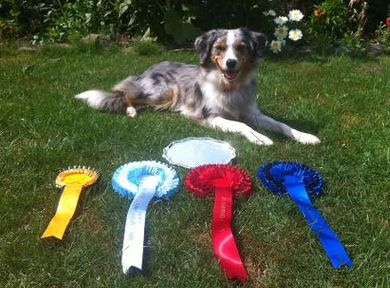 Tia got placed 3rd at her very first show and won a 1st & another 3rd place within a few days at the next show! Tia won out of grade 3 within a couple of weeks of competing and has shot up the grades winning many classes and she is already in grade 5! 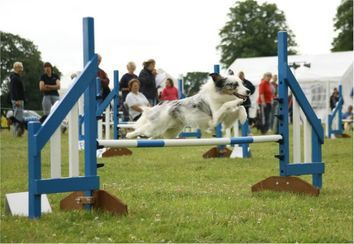 In USA we have Dunnellons Dorje Temba Dash owned & handled by Diane Gibbons who has started competing in Agility competitions & will be representing Dunnellon on the other side of the Atlantic! Left in photo: Fae who is a little rising star! Middle: Flossy & Billy showing the youngsters how it's done & setting the example! Right in photo: Dunnellons Kanga Roux who is owned & trained by Apryl Parfitt and Dunnellons Kickback Toby who is owned & trained by Craig Goodman. Both of these youngsters are from our last Dunnellon litter along with their siblings Dunnellons Boomerang, Dunnellons Man in Black, Dunnellons Takara Jasper and our own Dunnellons Place Your Bets who are all currently enjoying agility training. We are hoping these youngsters will be competing in the next year or so as they all love training & are showing lots of potential.